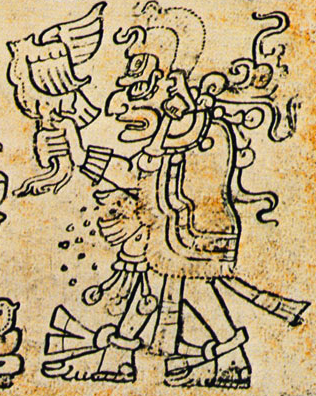 On December 21st 2012 – or maybe the 23rd, depending on whose translation you go by – the 13th baktun of the Mayan calendar will come to an end. A baktun is a period of 144,000 days or 394 years. Since the 1990s some have been saying the world will end on that day. Through the Internet it has become the best-known prediction of the end of the world ever. The Maya themselves seem to be pretty calm about the whole thing. Some of them say it will bring a birth of human consciousness, others that it is just a cool date to celebrate, like January 1st 2000. Either way the world will not be destroyed. 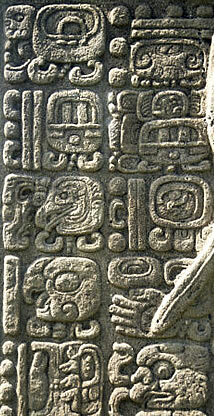 The Maya have three calendars. The one that supposedly ends in 2012 is the Long Count. It comes from the Olmecs and was the first ever to use zero. It fell out of use long before the Spanish came. … it will happen a ‘seeing'[?]. It is the display of B’olon-Yokte’ in a great “investiture”. B’olon-Yokte was a god of war and the underworld. He was present at the creation of the world and will appear again on December 21st 2012 – though maybe just as someone dressed like him to mark the day. Pseudoscientist Erich van Daniken, he of the ancient astronauts, says B’olon-Yokte is a being from another world who has been here before and will come again. According to the ancient Maya this is the fourth world created by the gods. The third one lasted 13 baktuns, from about 8240 to 3114 BC. In 2012 this world will reach the very same age. This is how some Westerners got the idea the world will end. But the Maya themselves, both now and in the past, do not seem to believe that. The ancient Maya seemed to think this world will last at least 17 baktuns. That would give us another 1,577 years. No planets will line up on December 21st 2012. NASA says there is no science to support the idea that the world will end in 2012. An asteroid or comet could hit the earth and wipe us out but nothing that big will hit the earth in 2012 and probably not for at least another hundred years. One of the scientists who looks out for things like that is going to buy some egg nog and enjoy his Christmas. – Abagond, 2012 (Mayan Long Count 12.19.19.17.19). Hmm…. In a way, I kinda was wishing the world was ending today, I’m calm about the whole thing. White people is another matter, they are always terrified of the world ending, simply because they have, everything to lose. We as black people don’t have our hearts, invested in riches and power like they do, plus White people are not as spiritual as black people, being they don’t feel they need god, when they have money and power and aren’t oppressed. So they fear the unknown about death, way more than black people and make states like” when you die, that’s it, your just dead” there are more white atheists and black by far. We as black people, feel there is a after life with Jesus, much less scary than white people’s atheist version. Happy 2013 everyone, that’s all I have to say. I am much more worried about the economy and the nutcases who have access to nukes than about the sun frying us and a meteorite blowing us to smithereens. we would not get a lot of warning if a meteorite came our way, but we would get some, and there is nothing yet on the horizon. On the other hand, I am all for having big parties!!! I don’t think it’s the end, just the ending of a particular period and the begining of a new one. I was thinking of doing a post Titled – nine one one and everybody’s end of the world – or something along those lines – wherein I expound on how if you ,me or anybody dies,will die or has died its the same as the entire world ending – your dead permently. You make some very interesting observations however ,the atheist interpretation may not be as valid as you think as I’m an athiest and I became one as a child while living in the ghetto – and while I’ve grown commited to social justice – I’ve not regreted my childhood decision one bit – indeed it’s one of the few things from that past I can say I’m proud of. As to an afterlife – its always looked to me like a evasion and denial – yeah just like everthing else in this universe when your dead your dead – no pain no pleasure – just end. It is kind of bizarre that an asteroid came so close to earth this week. I am black and an atheist. Not mutually exclusive apparently. Rofl these dummies done predicted the wrong date again.I don’t understand why people are so fearful of the end of the world.I don’t think it will happen in my lifetime,in the meantime all you can do is be kind to people and love yourself and family. Scientists don’t know everything.I noticed shows like doomsday preppers them white folks were being all scared and building underground bunkers.Whites fear everything it seems.The news shows them black crime,so they buy guns,conspirators tell them the world is ending,they build underground bunkers and buy more guns.Next they are going to be buying tickets to live on the moon or this so called planet x to get away from the earth they are destroying,it will be white flight outta this world a whole nother level lol.white flight to the moon will be hilarious they probably gone be up there saying yeah we finally got away from those poc and we have our guns.Then the aliens will come and they will enslave them lol karma. Someone I know who has super spiritual, New Age type beliefs also said something about a planet Nibiru, but seemed to think the world ending was rubbish. I was surprised since she believes everything she reads that claims a spiritual basis. If a spiritual person wrote a book and found some isolated tribe and claimed there were ancient carvings of Godzilla in a cave near them and the tribe spoke fondly of a giant lizard who was central to many of their prayers/rituals, she would believe Godzilla really existed. As for myself, I never believe end-of-the-world predictions and, even if they were to turn out to be true, I don’t think I’d care all that much if I were to die. Especially if the whole world is going with me. Now, if I knew I alone were going to die and my husband, family and so on would still be alive I think I would feel differently. You stole my bucket list!!! I was kinda hoping it would end, would’ve saved me some money – instead now i’ve only got a few days left to buy all the family’s christmas presents. LOL. Depending on where you are, I would not bother. People are so rude this time of year and I would not recommend going out and bothering with them. Maybe they will be more cheerful seeing as the world did not end. I agree with @tehnoun….I didn’t even realize it was D-day till 10:30pm the night before. My family’s Hindu, and there has been a lot of talk about “kali yug” ending (a time of destruction and upheaval), to give rise to the next time period in the universe’s life cycle; a time of human consciousness, and becoming more spiritually inclines etc etc…..
As someone who’s been writing about this end date: 21/12./2012 for some time now I am astounded at the level of ignorance and ill-informed speculation thats been written and encouraged here. There are no true official accounts by the Mayans proclaiming an apocalyptical end to the world. This is simply a Western media construct! Not for the first time Abagond appears to have done only scant research but more importantly and shamefully chosen to just faithfully regurgitate what the mass media have been publicizing and saying for the last umpteen years about the end of 2012. One (me in particular) can only hope that such a prediction will come to pass! But if it does, it WILL BE THE END of the world for those that are thoroughly immersed in the corruptions this current world/age offers. It’s the sort of end of the world I’m looking forward to – an awakening – epiphany/mind/spiritual/revolutionary/radical shift on a universal/cosmic scale. I remember going grocery shopping toward the end of 1999, and seeing people loading up on “survival” supplies. I mean, not just one or two items that you might need to have because they’d be handy, but full on “prepper” hoarder craziness. One woman had Thomas Guides (remember those?) for every area of Southern California, about 20 gallons of water, 4 little and 5 large flashlights, about two armfuls of batteries, a shovel, and enough boxes of granola bars to last about three months. Plus her “regular” groceries. At a garden variety super market — not WalMart or Costco, just a grocery store. It was so bizarre. All I could do was snicker at what she must have thought was going to happen, and wonder in amazement that she had so much discretionary money that she could just buy all that stuff on a whim. I mean, if the world was really going to end January 1, 2000, no matter where in Southern California she went, the world would be over. If some life altering, world changing event were to occur, it’s not going to pick and choose where it happens — it’s going to happen in Los Angeles AS WELL AS Orange County; it’s going to happen in San Diego, Palm Springs, Santa Barbara, and Bakersfield. Having granola bars and maps wouldn’t change any of that. And that’s when I understood the full brunt of white privilege. They’re so used to having the entire world at their fingertips, of going anywhere and doing anything, they think they can side step a cataclysm. This notion that everything is theirs, that anywhere they go, they can just set up camp and claim the territory is astounding. Where does that come from? This is true and is precisely what it will mean for those people still choosing and wishing to pursue morally unethical practises. These types of behaviour have become unsustainable and reckless for everyone on this planet. Um, from delusions of grandeur or narcissism or sociopathy..take your pick, either way, it’s called psychosis by most of the world. @Peanut and Sondis; I like those comments. I was disappointed it didn’t happen.